Mia sporting a Harry Potter scar! He may be the 'Chosen One', but Miracle Mia is the Survivor! It’s about time for an update, and I’m sorry, but I’ve been too tired or too busy to do one any sooner. And I know how many people have been waiting for one. Thank you to each and every one of you who are checking for updates; who are sending your thoughts, your love, and your continued prayers for Mia’s full recovery. I can tell you, it must be working. It’s ALL been working. Someone, including MiaBella, has been listening to your pleas, your prayers, and your calls for intercession. Personally, I’m glad and happy to announce that I’ve signed up for an “Unlimited” plan on my prayer and ‘Miracle Request Texting’ contract. Otherwise, I’d beWAY over my minutes this past month and a half! Back to the post, and with respect to why it’s taken so long to do a new update, well……. in all honesty, for a couple of weeks there really wasn’t much that I wanted to ‘post’ about. Mia was really in a ‘holding-pattern’. Things weren’t getting dramatically or particularly worse, but she wasn’t getting better either. And while many kids were coming and going from the ICU, it appeared that at least part of the C.I.C.U. was destined to be renamed after our little girl based upon length of stay. And how fun do you suppose it is to post or even talk about how crappy things have been going? or the lack of progress? No. That stinks. So I didn’t. I suppose that’s not an overly accurate description of what’s been happening, but I can’t really explain what it’s been like on a day to day, or even week to week basis at all. You see, for whatever reasons, Mia entered another stage of this adventure which involved a healthy dose of ‘Up and Down’, with a special emphasis on losing weight, lousy lungs, and transient fevers. One day, her lungs would be better. That’d be the ‘Up’ part. The next, the lungs would be worse. That’s the ‘Down’. One day she’d be lucid and aware. The next, she wouldn’t open her eyes unless urged to do so. You get the picture. And frankly, this part of the story isn’t much fun to write about. Dr. Kaza removed her last chest tube Tuesday, July 12, while they were doing the weekly biopsy of her heart, and checking the pressures in the heart itself. The report was that her heart looked better than it ever has! And that the pressures in the heart were the best to date! All good things! He placed 3 new sutures in her chest incision, which made Dad feel much better, and removing the last chest tube seemed to have really kick-started her lungs! And the very next day Mia was given permission to make an excursion to the 3rd floor outside deck, to look out over the valley …………….and enjoy some fresh valley air! Mia's first day without the endo-tracheal tube! July 4th (Mon. ): Mia is extubated! 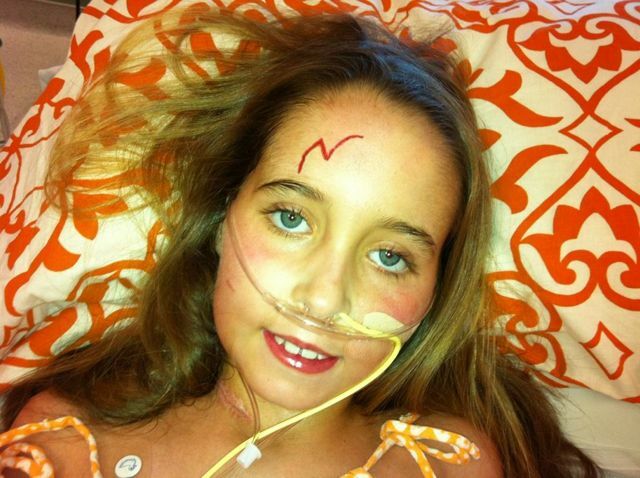 We can’t believe she seems able to support herself with nasal cannula and Oxygen only! In celebration of Mia’s Day of Independence! and our Nations Birthday, I went to the ReAL Salt Lake Soccer game! It was amazing! Front Row! A gift from a brother. Mia battles the Bi-Pap face mask while Ceeta watches over her. July 5th (Tues): Back on respiratory support in the form of Bi-pap. We began with a nasal mask, and after several tense hours we moved to a full-face mask. Mia became very withdrawn, and responsive or awake only when aggressively prodded. At one point in the afternoon/evening, we were on the verge of replacing the endo-tracheal tube. Her blood-pressure, pulse, and O2 saturation were all over the place. It was a stressful night. July 6 (Wed.): ….. more of the same. At least Mia seems to have stabilized on the full-face mask of Bi-pap. Still not really responding unless bugged. Still can’t talk, but can barely whisper a little. 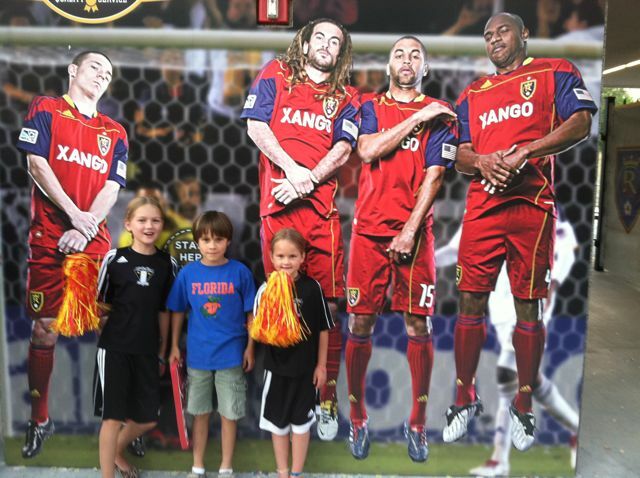 everyone climbs aboard as the boys from ReAL Salt Lake visit and express support of Mia. July 7 (Thurs. ): ReAL Salt Lake!! The visit from Nick Rimando, Kyle Beckerman, Johnny Kimball, and Brook Bingham from ReAL Salt Lake. We took her mask off for the short visit, and Mia was able to enjoy seeing these good men. Still can’t talk above a whisper, but is able to keep her eyes open for a few minutes at a time. Mia seems a little better. I’m feeling better……… I think. Mia enjoys her first view in over a month. July 8th (Fri.): Mia surprises us all by being awake enough to make her very FIRST trip out of her room and off the bed to the window overlooking the valley and city. It was absolutely amazing! It wasn’t the sunset I wanted for her, but she just stared and stared…… Salt Lake City sure is a beautiful sight, and never more beautiful than this night! Look at those eyes....... the Eyes of a Warrior. I WILL survive! Eli, Taye, and Mia C. join Kyle and the boys in the 'wall'. ReAL game against Dallas. Not only did the boys win 2-0! Mia continued her steady pace……. just trying to get used to the Bi-pap, and showing the Doc’s what a Miracle Kid she is. 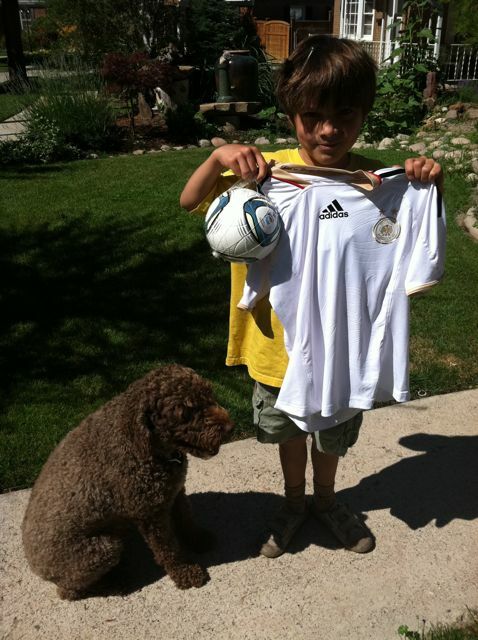 jersey from our friends in Germany! (displayed by brother Eli!) Danke, Andy, Susanna, und Maxi!! And the evening was greeted by an excellent sunset and rainbow combination! Mia celebrated ReAL and her own progress with another visit to the window. Maybe good things are really on their way?! Mia sports the K-D's and greets me with a smile! July 11th (Mon. ): You can’t believe my emotions as I am greeted with my daughter’s face Without the mask, and a smile!!! Eli and Mia embrace. Best Friends. July 12th (Tues.): The Big Day! This is the day I was writing about earlier. And Eli greets his sister and hears her voice for the first time since May 27th, as they tell each other, “I love you”. Mia, Kendra, and Megan. Three Beautiful and Amazing young ladies. Miracle girls...... each of them. The moment, the’video’ of these three girls and Carissa singing this together was one of the most beautiful and touching moments of this entire experience. Just before they sang this together, Mia told Megan that she thought what had happened to her was “a curse”. We hope, that with time and everyone’s love, Mia will find a way to see this experience as something other than a Curse. But, right now, who can blame her? So, Since Tuesday, so much has happened. Unfortunately, as Mia begins to get ‘better’, her awareness of her New Life has also grown, and brought with it major frustration and a solid dose of untold sadness. Perhaps the fact that we are moving away from mere survival, and into realization of our situation, this is a good thing? Life must go on. Sometimes, when it’s quiet….. and I’m alone,…… I think a lot like my daughter. And I just wish it was a bad dream. But it’s not. And then, I get a call from a brother of mine thousands of miles away, and I’m reminded of my role, of my strength, and of the beauty in this tragic experience. It’s Life. And it’s ALL beautiful. Just ask Michael Franti, who says it like no other! Thursday night Heidi and I were given the gift of two tickets by a thoughtful and beautiful lady Kami, and we spent our first “date” amidst an overwhelming feeling of Love, Acceptance, Joy, and Hope! If you’ve never seen Michael Franti and Spearhead in concert, then you should make the effort. It was the most uplifting and emotionally positive concert I’ve ever attended, verging on a spiritual experience. I would like to write more about this incredible moment, but that would take another couple of days for me to find the words. Let me just say that it was more than I ever expected, and everything we needed. After the concert I approached Michael, who was greeting people, and gave him a “Pay it Forward” wrist-band. Heidi said, “Give me your ‘Mia’ bracelet”, and she made her way back to Michael, quickly told him Mia’s story, and he gave her his total attention. He looked her in the eyes, gave her a hug, and reached into his pocket and gave her a guitar pik. The hug and intense eyes were the real gift. Along with the words throughout the night. So, thank you to Tiffany Glasgow for the ‘Just Add Fun’ picnic package full of love, and everyone there who came up to give a hug and express your love. It was amazing. So, as I watch the USA vs. Japan in the FIFA Women’s Soccer Final with Mia, we cheer not only the Stars on the field, but we cheer Mia’s success, and impending departure from the C.I.C.U.! Yes, it’s true! Mia might be out of the unit by early this next week! Keep your fingers crossed and your thoughts and prayer’s coming! We love and appreciate all of you! Give your loved one’s a hug. Cherish the moments. So glad to hear things are going so well Not a day goes by that I don’t think of MiaBella and offer an affirmation of hope and health. Mia, you look beautiful ! Be strong and keep smiling ! You are on your way ! p.s. Uncle D & Aunt S send their love as well. Thank you so much for the update…Mia, you go girl. We will envision you out of that CICU as soon as possible so that you can be able to have more time outside and with friends and family. Our love to you! We’ve been keeping up with your amazing journey and just wanted you to know how much you have been in our thoughts, hearts and prayers. Keep up the strength. You are all heros and Mia… you are an amazing person. Keep smiling and know that so many people love and charish your spirit, smile and being. p.s. 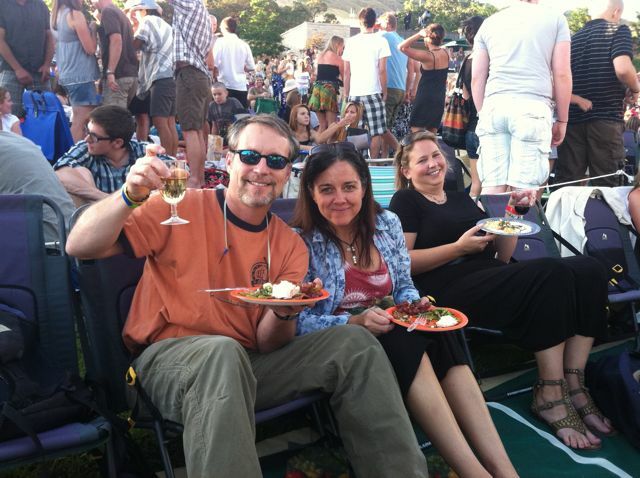 Michael Franti is a true spirit of goodness – I was there too, “say hey… i love you”. I know he pierced my soul Thursday night… can’t imagaine how he must have warmed yours. Cheers!